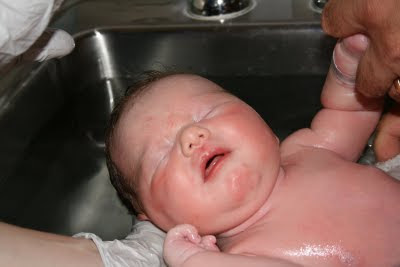 She was born at 11:42 last night, and weighed eight pounds and just over an ounce. She's 19.75 inches long and she's gorgeous. I got to wear this space suit for the momentous occasion. The doctor used to be a veterinarian and he performed a ridiculously fast surgery. I asked why he tied a cord onto the bar near Krista's head and one of the nurses told me it was because he was used to doing c-sections without any help. 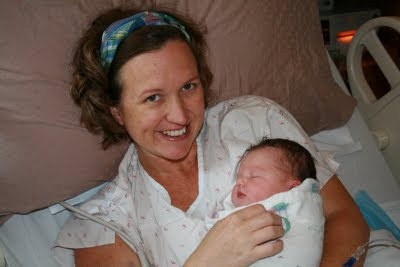 Krista is doing great... much better than I've seen her do in previous deliveries. The staff here have been excellent. Krista hasn't gotten much sleep yet, but hopefully that's coming soon. 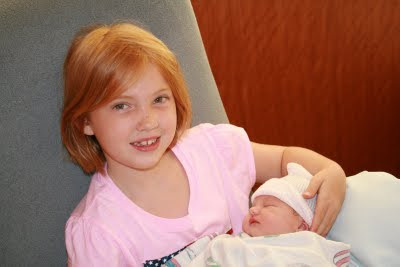 We let A come over in the middle of the night last night, and she was thrilled to meet her little sister. Z is at summer camp, so we called her this morning to share the joyous news. SHe was disappointed to miss the birth but said it was amazing to know she had a new little sister. 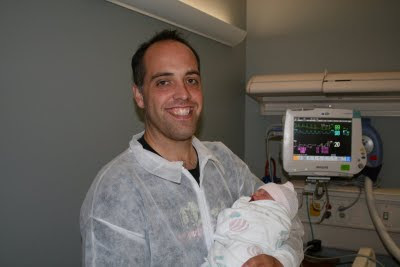 I'm so thankful to have a healthy new daughter, and that Krista is doing well also. We see Baby M as our miracle child... after two miscarriages our pastor preached on healing, and another one of the pastors prayed for us to be able to have another child... and here she is! Thanks to everyone for all your prayers and your friendship. We'll be in the hospital at least through Friday... we'll keep you updated! Wonderful Wednesday: We Will Love Watermelon! It is too cute for you! Friends, I had a great deal of fun reading your entries into the Imaginary Jesus Tagline Contest. I naively thought there would be one spectacular entry that would trump all others, but I was mistaken. There were many excellent entries and after a lot of vicious indecision, I've come up with a list of my top three favorites, all of whom will receive the prize package... a free, signed copy, mention in the acknowledgments and my gratitude. 1) "Imaginary Jesus: beyond the flannelboard" from Janet O. I like the Sunday School reference which reminds me of a lot of my childhood experience of Jesus. I have a soft spot in my heart for flannelboards. Also puppets. 2) Sam said... Imaginary Jesus: Hot pursuit of the most popular man who never existed. I think what I like about this one is "the most popular man who never existed." I like the irony of it. 3) I'm guessing we could never use this one, but it made me laugh so hard that I had to give Kyle a shout out and a free book. Kyle Collins said... Imaginary Jesus: De-robing the Messiah. That's so wrong that it is a sort of classic. So, congratulations Janet, Sam and Kyle. The book comes out in April, so enjoy your long wait. As for the rest of you, lots of excellent entries... I've been talking with the people at Tyndale and I think we're going to have more contests in the months to come. Keep your eyes peeled (eww). I couldn't resist linking to cheese in space. 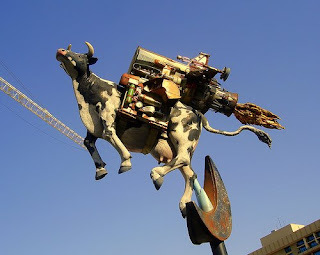 The chairman of the endeavor says, "It seemed appropriate... that we should mark the anniversary of the first moo-n landing with a giant leap for cheesekind." I am a little disappointed that no rockets are involved, so I have included the photo at left. Imaginary Jesus tagline winners announced tomorrow! I have the tagline contest whittled down to the final round, and by tomorrow I will announce the winners! There are plenty of good ones to choose from, but I do have my favorites. Yes, the very popular EATR robot has been recently released. It can devour biomass. Rumor is that it can eat human flesh. But no, says Robot Technology Inc. “We completely understand the public’s concern about futuristic robots feeding on the human population, but that is not our mission,” stated Harry Schoell, Cyclone’s CEO in a recent press release. No, I suspect that mission belongs to another robot technology department. Besides, the military would probably not name a flesh eating robot "EATR" they would name it something like "SAM" or "NUMBER 5" or "WALL-e". At last, something from my childhood movies is becoming reality. I may not have a rocket car or a jet pack, but thank God there will be Robot Vampires. Yay! I know what you are wondering: Matt, how do you feel about the impending robot revolution? 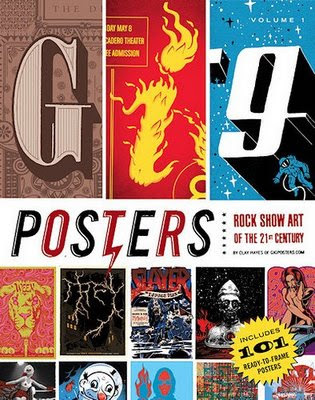 An interesting article in the Oregonian yesterday about Portland-based artists who specialize in rock and roll poster art, including people like Mike King, Guy Burwell and Emek. I want one of these guys to make a cool rock show type poster for the release of Imaginary Jesus and then I'll ship them out to people and we'll put them up on telephone poles. It will be awesome. Now I just have to steel myself for the inevitable discovery that it costs lots and lots of money to get one of these posters made. Right? In other cool art news, Sarah from Tyndale (she will be famous by the time my book finally gets published) sent me some cover ideas for Imaginary Jesus. There are five concept covers right now, one of which is my hands down, all around, can't see how other people wouldn't pick it first favorite. Krista would choose that one as number four or five. Anyway, sometime this week we'll spend some time discussing the cover concepts and hopefully move toward some sort of consensus between me, Sarah From Tyndale, Wes The Agent, Nancy The Publicity Person and Whomever Else gets a say. Here I am at the Denver airport with Krista and the kids, racing them home for a couple of days before returning to CO for our conference on Tuesday. I haven't seen the typical aberrant behavior at the airport that allows me to write entertaining posts so I will just have to make stuff up, I guess. Z woke up in the middle of the night not feeling well, so we're traveling with a sick kid. I bought my ticket using miles and through some weird fluke of airline pricing I got a first class ticket for the number of points as an economy ticket would have been. I lovingly gave that ticket to my wife, though, because I thought that when an eight and half months pregnant woman is flying she should be treated like royalty. I'll be with the kids in the back, which should be fun. Okay, off to the races. Have a great day, minions. Today's the last day to enter the Imaginary Jesus tagline contest! So send your best, wackiest, worst and goofiest ideas in now! Strange Horizons is an online, weekly speculative fiction magazine. All of which is unnecessary prelude to the fact that you must read LET US NOW PRAISE AWESOME DINOSAURS! It is the story of Martian dinosaurs come to earth to do stunt car racing. No, really. 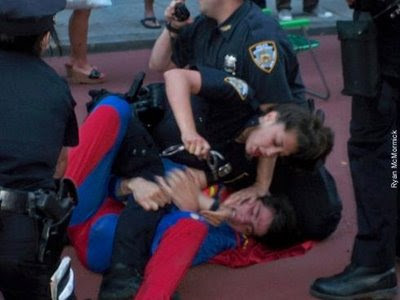 And, like many good things on this blog, I came across this via boingboing. 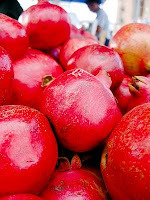 Some people say that the "Fruit of the Knowledge of Good and Evil" in the Garden of Eden was actually a pomegranate. I buy it. I think Adam and Eve took a bite and blood red juice got all over them and stained their skin. Grenades are named after them. It's also the inspiration for the best phone ever. I don't know if you can get it in the States yet. One issue: don't you think it should be spelled "pomagranite"? Stumbled on a weird and wonderful blog today that puts up strange maps and then comments on them in detail... everything from a Russian thinker's future US map (for after our financial collapse) to a map like the one above... detailing by color where people prefer to call soft drinks "soda" or "pop" or "coke." Click on the map for a closer look, it's well worth it. Obviously the correct term is soda. But I grew up in California, so maybe that's just my cultural bias showing. Feel free to leave a comment defending your own preference. I have a weak spot in my heart for comedy musicals. 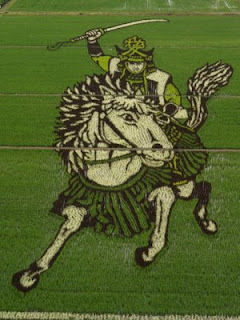 This is rice paddy art. 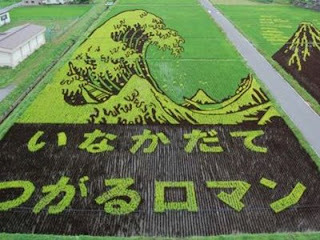 It's made by planting different colors of plants in the rice paddy fields so that it makes a recognizable pattern. 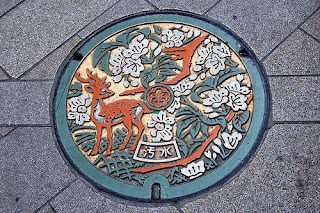 Certain areas of Japan are famous for their elaborate ones (like the samurai above, which is on display this year). I had no idea about this until I read about it in Boingboing yesterday. Sarah Atkinson, one of the acquisitions editors at Tyndale, talked with me yesterday about the Imaginary Jesus tagline contest. She started by saying, "I have a bone to pick with you." I suddenly realized that I hadn't talked with anyone at Tyndale about my little contest. Uh-oh. Then she said, "What do I get if I win the contest?" I said, "The same thing as anyone else." Because she should really read the whole post instead of skimming, that's what I say. But she pointed out that the likelihood that she would receive a signed copy anyway was pretty high since she's working on the book and I'll be crossing paths with her at various conferences and events in the future. I told her that I wasn't some pushover author that would just cave and give copies to someone just because they were pushy acquisitions editors. But she pointed out that she could probably wear me down eventually. So I have to add this addendum to the rules: "If the winner of the contest doesn't want the other prizes listed, they may choose to receive instead an original Matt Mikalatos hand-drawn picture of a pony or unicorn. In color." 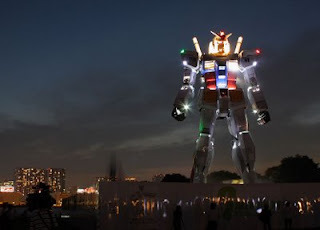 I keep forgetting to post about this rad full scale Gundam model in Japan. My friend Alan sent me this link a while back. Neat! Imaginary Jesus: The best friend you never knew you had. Or preferably something better than those. 1) Enter by posting your tag line idea in the comments section of this post. Post as many as you like. 2) I'll need some way to get ahold of you if you win. So anonymous, contact-less entries won't get a prize even if they win. YOU DON'T HAVE TO HAVE A BLOGGER ACCOUNT TO LEAVE A COMMENT! And if you want to send me your contact info, post your comment and then write me at matt.mikalatos(at)gmail.com. 3) It has to be original and it has to be yours. So taglines like "In space no one can hear you scream" or "Plop, plop, fizz, fizz, oh what a relief it is!" don't count. I guess you can post them just to be funny though, you sick, sick people. 4) Deadline for entries is July 17th, because that's my birthday and because I say so. 5) No whining if it takes a while to announce a winner, because I'm learning that the publishing world spins a little slower than the world outside. Whiners automatically forfeit all rights except for those specifically granted under the Magna Carta of 1215. 6) All entries must be type-written. 7) It's a tag line, not a poetry contest. Keep it short. Haiku length or shorter. It's a three parter. TO THE WINNER GOES THE SPOILS! ONE, your name in the acknowledgements of the book itself. TWO, a copy of Imaginary Jesus signed by the author (when it comes out of course). THREE, my gratitude. I will even write a thank you note to you. Of course you also get bragging rights, but that goes without saying. Now get to work, people. Okay, I'm not a lawyer but just so you know this contest is illegal wherever such contests are illegal, and is not sponsored by Tyndale, Barna Books, Campus Crusade for Christ or anyone associated with those organizations. Final determination of who wins goes to moi (moi = Matt Mikalatos) and whomever I might choose to include in said determination. Moi reserves the right not to use a tag line, to use multiple tag lines or to use a tag line not generated by this contest. By leaving a comment and/or tagline here you are giving permission for it to be used in the publication and publicity of all kinds for Imaginary Jesus. Forever. In the whole universe. And other dimensions. Even other dimensions where, perhaps, you are evil instead of the pleasant, reasonable person whom you appear to be here in our dimension. Please remember that in the end this is all for fun. It's not like I'm promising, for instance, to make you the poet laureate of a laureate-less state. Today a bunch of us from Xtrack went up into the Soapstone Prairie Natural Area to help the city of Fort Collins with weed control. There's an invasive species of weed and we were just the people to help get to the root of the problem. Toward the end of the day a storm appeared on the horizon and a low grumble of thunder echoed across the prairie. Pat, our guide, immediately told us to grab out stuff and head for the van. We all made some jokes but he started telling us that lightning could strike from several miles away, and that we should spread out and not run and that several people die from lightning strikes every day. He didn't care for our jokes about lightning. This suddenly reminded me of when I was in an earthquake in Seattle and people kept saying things like, "SHOULDN'T WE RUN OUTSIDE?" Which, of course, you should not. Then I looked down at the street afterward and people were walking around looking up into the sky. As if the earthquake had somehow come from the sky. I decided that -- as a service to all the other non-Coloradoans living in Fort Collins this summer -- I would publish the strange and unfamiliar rules of lightning as found at the National Lightning Safety Institute. 1. PLAN in advance your evacuation and safety measures. When you first see lightning or hear thunder, activate your emergency plan. Now is the time to go to a building or a vehicle. Lightning often precedes rain, so don't wait for the rain to begin before suspending activities.